The Centers for Medicare & Medicaid Services are issuing new Medicare cards in 2018. Download information now by clicking on your preferred language for any document below. 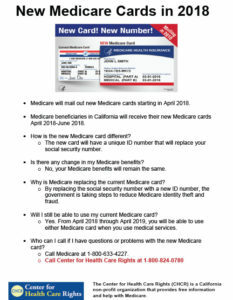 If you are a Medicare recipient living in California, you should have received your new Medicare card. Sign into MyMedicare.gov to see if it has been mailed. If it has been mailed, you can print an official card. You will need to create an account if you do not already have one. Remember, your old Medicare card can be used until April 2019.